Food Chain / Food & Drink Chicken sandwiches—not that there's anything wrong with that! Leghorn Chicken, the long-awaited chicken sandwich stand from chef Jared Van Camp and the others at Element Collective (Nellcôte, Kinmont, etc), opened at 11 AM at 959 N. Western yesterday, and closed less than two hours later, all 600 of the chicken parts prepared for its sandwiches gone. Under normal circumstances 600 would be a very ambitious number for a sandwich shop on opening day, so I wouldn't say that I think selling out was exactly part of the plan—but I doubt anybody really minded it either. As with Brendan Sodikoff's Green Street Smoked Meats a month ago, running out on opening day makes for good buzz, perfect for spreading even more widely by social media. In any case, it's proof that there's no such thing as a neighborhood restaurant or a soft opening any more, as a corner on Western in Ukrainian Village became Chicago's foodie epicenter on a Thursday—for an hour and 45 minutes, anyway. If you weren't aware of Leghorn until everybody had already been there, it combines much of what's of the moment (and different from a certain chain chicken joint that closes on the Lord's Day). 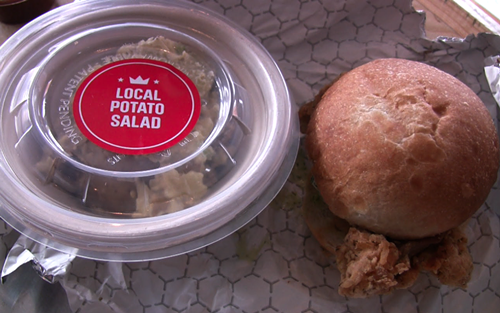 The chicken is local and sustainable; the approach evokes authentic southern styles, including "Nashville hot" (a nod to the incendiary chicken at Prince's and other Oprytown favorites); and it gives money to support gay rights, a bonus for people who are jonesing for a sandwich from that other place but are unwilling to support it. Leghorn reopens today at 11 AM with another several hundred pieces of chicken; the first reviews should start coming out any moment, I suspect. • Keeping to our southern theme, Dr. Anthony Buccini, well-known on the old LTHForum as Antonius, will give a Culinary Historians of Chicago talk on Saturday at Kendall College on the linguistic and cultural origins of some classic New Orleans foods; it's called "Jambalaya, Congri and Hoppin' John: Culinary History in an Atlantic Context 'From the Bottom Up.'" Details here; tastes will be provided. • On Sunday night the West Town restaurant Two will host a Beast Dinner that utilizes a full front quarter of beef from Slagel Farm and star chefs Shawn McClain, Mark Steuer, and Jason Paskewitz; there are also appetizers from West Loop Salumi. The dinner is $90—which gets you four courses, plus beer and wine—and the afterparty is an additional $20; proceeds from the latter will go to Chicago Pit Stop Rescue, a volunteer-staffed nonprofit devoted to so-called bully breeds such as pit bulls. Call 312-634-8363 for reservations. • Next Thursday Vera will host a four-course dinner focusing on the sherries of Valdespino and La Guita. It's $100, including a tapas reception, beverages, and cheeses; more details here.